Creepy Hour is 3-6 PM on Halloween. $3 pints, wine, wells and 1/2 price Monster Nachos & Chicken Bones. 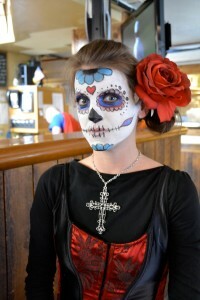 $25 Dam gift certificate goes to the best costume in the bar at 5 p.m. Plus kids dressed in costume EAT FREE 5-10 PM. Receive a framed family photo & candy with the purchase of an adult meal.